There are currently 187 people online. 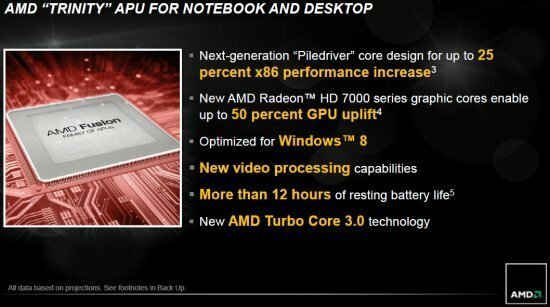 Previously, after it became clear that AMD's new chips would only emerge on the market in the middle of the year, it was widely believed that AMD would introduce its long awaited A-series "Trinity" APUs at Computex 2012 trade show in Taipei, Taiwan, in early June. However, a report at Sweclockers.com web-site, which was confirmed by an X-bit labs source with knowledge of AMD's current plans, points to May 15 as the formal introduction date of Trinity. The source specifically noted that only mobile version of the APU will be unwrapped. Launching a new microprocessor ahead of a major trade show makes a lot of sense for AMD. Great attention will be attracted to the new chip amid the absence of other major announcement from different companies. Moreover, such announcement will help to at least partly avoid direct head-to-head comparison with the arch-rival from Intel, the code-named Ivy Bridge processor. Unfortunately, given the fact that only mobile chips will be introduced, it will be impossible to determine maximum potential of Trinity in real-world applications. The site says the 35W Trinity APUs deliver 25 percent higher scores in PC Mark Vantage Productivity than the 35W Llano, and 50 percent better results in the 3DMark Vantage Performance test.